It's great to have accessible features, but you have to make sure that they remain usable! Cluttering an aisle with merchandise or seasonal displays makes it unusable, as does piling snow in accessible parking spaces or using the spaces to store and display seasonal merchandise such as mulch and plants. Toilets become inaccessible when the grab bar is loose or when supplies are stored in the accessible toilet stall. Newspaper sales boxes can block access to a ramp or door. Staff and customers without disabilities should not park in accessible parking spaces. Businesses are responsible for maintaining the accessibility of their facilities and equipment. All the equipment and features that enable people with disabilities to access your goods and services must be maintained in good working order. When accessible features are blocked or broken, your business is no longer accessible. A woman using a wheelchair, with a service animal, is opening the door to a convenience store. The store's ice box and newspaper sales box are on the sidewalk, but are away from the door, so they do not block her entrance. The path a person with a disability takes - starting from the sidewalk or parking lot and going to the places where a business provides its goods or services or other amenities for customers (such as restrooms) - is called an “accessible route.” This route must remain accessible and must not be blocked by obstacles such as furniture, filing cabinets, or potted plants. Similarly, accessible doors must be unlocked when the place is open for business, and the accessible counter at a cash register must not be cluttered with merchandise. Special holiday displays are fun for everyone, but they should not obstruct the accessible route needed by customers with disabilities. When it is necessary to block aisles temporarily to restock shelves with merchandise, it is best to do this in slow hours when few customers are in the store, or to block only one aisle at a time. Businesses must be prepared to retrieve merchandise for customers when an aisle is blocked. 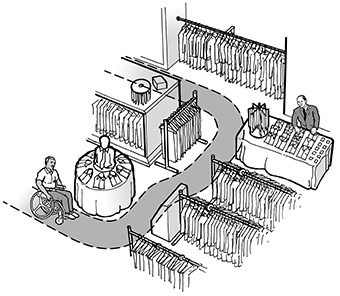 A man using a wheelchair is shopping at a men's store. 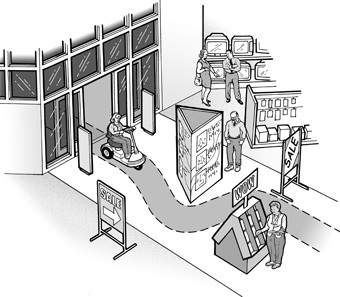 Adequate aisle space makes it possible for him to move around the sales area. Inside a department store, the promotional signs for a sale are prominently located, but they do not block the accessible route. Accessible equipment should also be maintained in good working order and be available for use by customers. Broken elevators or lifts and ones filled with merchandise or trash do not provide access. When equipment is temporarily out of service for maintenance or repair, a business should repair it as quickly as possible and, in the meantime, find other ways to make its goods or services available to customers with disabilities. The ADA recognizes that isolated or temporary interruptions in access due to maintenance or repair of accessible features are sometimes unavoidable. You should emphasize to your staff the importance of maintaining an accessible environment for customers with disabilities. When your staff understand this, your business will operate more smoothly and your compliance with the ADA will be smooth.